Jamhuri Park will be the venue for the season’s Kenya Cup first double header when Nondescripts RUFC host Mombasa in an early kickoff before Homeboyz face Impala from 4 p.m.
Other matches on the day see Kenya Harlequin FC play Mwamba RFC in a live broadcast encounter at the RFUEA ground while Kabras Sugar welcome Nakuru RFC to the Kakamega Showground. KCB host Blak Blad at the KCB Sports Club with the Strathmore University taking on Kisii RFC at Madaraka. Impala stayed top of the Kenya Cup log after their second successive bonus point win, a 30-12 result over Mwamba. Champions KCB’s 33-6 win on the road saw them climb to second with Kabras Sugar working their way to third following that 44-13 result at home to Strathmore University. Homeboyz round off the top four, who are all tied on10 points. They beat Nondies 29-21 at the Jamhuri Park ground. Quins and Kabras Sugar won big on Kenya Cup match day two, Quins racing to a 26-7 lead at home to Nakuru at the interval before closing out their encounter at the RFUEA ground 46-19, their first win of the season. Kabras Sugar posted a 44-13 win over Strathmore University at the Kakamega Showground. Kenyatta University’s Blak Blad made it two wins from two after beating hosts Mombasa 22-10 in Sunday’s sole Kenya Cup encounter at the Mombasa Sports Club. The varsity students scored four tries through Arcadius Kwesa, Ivan Chebo and Ian Okubwa who scored two. Levy Amunga added the solitary conversion while Gabriel Makatiani landed a try, conversion and penalty for Mombasa. 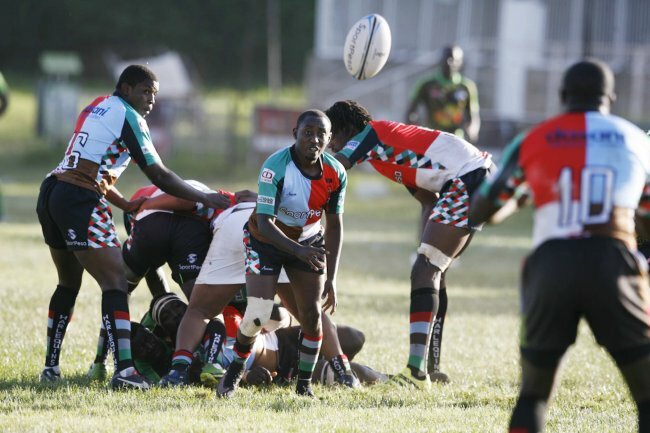 Quins returned to winning ways with an emphatic 46-19 demolition of Nakuru on Saturday. It was the vistors who went ahead when Geoff Ominde grounded the ball, Henry Ayah converting for a 7-0 lead. Quins responded almost immediately, Ugandan international Ronald Musajja with the touchdown, Kevin Njugi’s conversion levelling matters before converting further tries from the evergreen Tony Mutai and Dennis Muhanji in between Peter Misango’s unconverted effort, the hosts taking a healthy 26-7 lead into the break. Nakuru were an energized side after the break, scoring two tries in quick succession through Monate Akuei and Moses Okendo, Martin Muita managing one conversion as they came to within seven points of Quins, 26-19 on the score with about half an hour to play. Brian Beckham soon got himself on the scorers chart, landing an unconverted try before Lewis Olaka, back in action after a prolonged hiatus from the game grabbed himself a piece of the winning side’s pie, barging over with Njugi converting. Misango’s brace at the death confirmed the 46-19 result for Quins after losing 41-39 loss to Homeboyz. This was the first loss by Nakuru RFC, a reality check after last week’s 45-15 demolition of Kenya Cup debutants Kisii. Across the fence, Impala built on a 5-0 lead at the interval to cruise to a 30-12 bonus point win over Mwamba at the Impala Club. Mark Kwemoi broke the deadlock late in the first half landing an unconverted try for Impala just before the break. He added a penalty after the restart before converting Derrick Mayar’s try for a 15-0 lead. A try from former Kenya U19 international Daniel Ndome took the scores to 20-0 before Mwamba responded with a converted try to make it 20-7. Kwemoi converted Mayar’s second try for a 27-7 score but George Mutuku responded with Mwamba’s second try before Kwemoi drilled home a penalty to secure the 30-12 full time score, their second win in a row. Quins 46 Nakuru 19, Kabras Sugar 44 Strathmore University 13, Kisii 6 KCB 33, Mwamba 12 Impala 30, Homeboyz 29 Nondescripts 21. Nondescripts v Mombasa (Jamhuri Park, from 2 p.m.), Kabras Sugar v Nakuru (at Kakamega Showground), Homeboyz v Impala (Jamhuri Park), Quins v Mwamba (RFUEA ground), KCB v Blak Blad (KCB Sports Club) Strathmore University v Kisii (Madaraka).